This unique model of an human buttock has a special two-in-one function: On the right hand side, the anatomy of the bones, ilium crista, greater trochanter, m. gluteus medius, nerves and veins can be studied through the transparent outer structure. 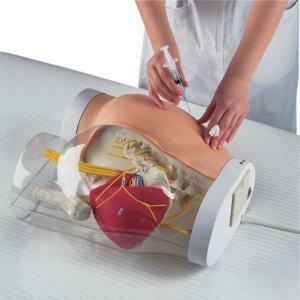 The student can transfer what he has learned about the position of nerves, veins etc. to the left hand side on which intra-muscular injections can be practiced. Anatomical landmarks can be palpated through the soft skin to identify the correct positions for injection. The injection of fluid (water) is possible. Correct injections are confirmed by a green light, if the injection is placed in a wrong position or too deep, a red light will appear and a buzzer will sound.